The reporting structure has been changed with emphasis on bigger core holdings and reporting on early stage venture holdings only when significant events occurs. *Please note: A reduction of value amounting to 100KEUR was made on the valuation of Savo-Solar Oyj’s shares, which negatively affected the Profit and Loss. We stated in our last report that we would focus on exit preparations, continued acceleration of our companies (including internationalization), and communication. I will tell you how we have done just that and also comment on a few things that have happened in a very busy first half of 2017. The first half of 2017 shows combined revenues of 60 MEUR (unaudited). This is more than a four-folding of comparable revenues one year ago and it is almost twice as much as the full year of 2016. Another thing that has happened is that we have increased our ownership in several of our high performing holdings over the last years. Our average portfolio ownership is now approximately 16% (it was approximately 13% a year ago). Last half year we increased or defended our ownership in several of our current high-performers, namely Eagle Filters, Nuuka, ResQ Club, Sofi Filtration and Enersize. Most of you noticed that Nocart signed a 200MUSD order for a combined solar-storage-diesel plant to Zambia during the first half of this year. The first invoicing of this order of course accounts for a majority of the revenue increase (unaudited) but it should be noted that several of our companies are growing revenues very well, mostly on international markets, as you will see in their performance overview later in this review. You will notice that we have a new format for this report. We have decided to frame each of our companies in light of the industry that they are disrupting. This is a better way to communicate the markets our companies operate in and how they are changing over time, as well as a better way to show the positive environmental impact that they are each having. These are the ‘mega-industries’ our companies are disrupting this time around: real estate; renewable energy systems; fashion; restaurant industry; manufacturing; water use; and natural gas electricity. We have turned the US ‘Pop-Up’ into a permanent office after seeing clear results from this initiative. The US joint venture arranged for Nuuka; adding Gudrun Giddings to our board; and attracting several US investors into Cleantech Invest shows that this strategic move to place our Chairman Lassi Noponen on the ground in LA has really paid off. There is plenty more to come from California and we expect more of our companies to launch there in the coming year. The Berlin pop-up was also a great experience and will be extended, with several of our companies now having German investors on board as a result of it. Additionally, we will be present full-time in Stockholm starting in September. It is not always easy to work together in such a geographically spread out organization but it really is providing excellent results that we would not have achieved otherwise. Having a team that knows each other so well makes it possible to work in such an effective way and this effort is also required in order to raise Cleantech Invest into global stage. We listed Enersize on Nasdaq First North Stockholm and raised 26MSEK to the company in the process. Enersize is our biggest holding, with an ownership of 37.7% after the listing, and we have spent a lot of resources growing it. The current CEO as well as Executive Chairman were brought in by us. We raised project financing to fund the initial cost of customer projects (Enersize sells their solution as revenue sharing so the upfront installation is typically paid by them) and we have brought in well connected investors and partners in China, Germany and Sweden to the company. As you can imagine, a successful listing with a strong shareholder base was an important milestone. It was an extensive roadshow with a lot of communication around it and we could not be happier with how investors have taken to the company. Cutting carbon emissions in the manufacturing industry with a software-based approach is clearly appealing. Enersize’s team is performing extremely well and customers are responding. The company has closed six new installation contracts during 2017, two of them just after the listing, and the reference customers that have achieved verified savings now include some of the world’s largest and best managed factories. We need to keep in mind that a lot of the current contracts are yet to be installed and payments do not kick in until after one year, so it will take a while before the big order intake shows in their results but make no mistake about it - Enersize is on its way taking a leadership position in energy efficiency in compressed air in the world’s manufacturing center. We are very confident in their future and will continue to build the company into the global leader in industrial compressed air energy savings. Nuuka is also entering an exciting phase. We have stated intentions to list the company, and have accelerated market roll out with excellent results. The company has closed its first US order and signed a joint venture there. The software is now translated to Chinese and first reference installations in China are happening as you read this. Nuuka is also looking to make further inroads in the Nordics as well as the Benelux . We are carefully monitoring the market to make sure we do a successful listing and also that we have a clear value growth path for the company once it is listed. The latter is extremely important as Nuuka’s potential listing would most likely happen on Nasdaq First North and we would aim to accelerate growth and create value while being listed on the stock market. Stay tuned and we will keep you informed. We see Swap.com as a strong IPO candidate with potential for exceptional value growth. The company has shown impressive growth for three consecutive years and is now the largest online consignment store in the US. The marketing department has been significantly strengthened and customer aquisition costs have been lowered drastically, making the path to profitability clear. Cleantech Invest has participated in an underwriting consortium to back Swap.com’s upcoming investment round, with a 1.5M€ underwriting commitment. Swap.com is working with Carnegie Investment Bank to execute a private placement. We are also taking more active roles to accelerate Eagle Filters and ResQ Club, both companies where we have increased our ownership recently. The first half of 2017 saw the dawn of our first ever impact analysis of our work. I am proud as a peacock that we managed to get this communication milestone done, even if we limited it to carbon emissions and water savings, and did it initially for ourselves and six of our portfolio firms. It was an eye-opener even for us, as the impact was even bigger than we had previously thought. A lot of you have already used the calculator on our web to check the impact your own shareholding is having but if you haven’t go ahead and do so! http://www.cleantechinvest.com/impact-eng. Our carbon impact for 2016 was minus 158 000 tons of CO2 equivalent, which corresponds to taking 107 000 cars in Finland off the road, or the per capita carbon emissions of 17 000 Swedish households. The water impact resulted in 9,6 million m3 freshwater savings, which corresponds to the household water use of 164 000 Swedes or 3840 Olympic-sized swimming pools. But why measure impact at all? Because we don’t see ourselves as successful if we do not have a positive environmental impact, and maximizing it is our purpose. So, to start understanding how we are performing in this regard is both useful and inspiring for us and hopefully also for you! And why is communication so important? Because under-achieving when it comes to communication is the most common bottle-neck for growth in most Nordic cleantech companies, including our own portfolio. The importance of packaging what you do in an engaging way, focusing on the right message for the audience and delivering it through the right channels, as well as nurturing your long-term business relations can not be overemphasized. We do not claim to be experts in communicating and we certainly do not claim to do everything right in this field, but we do realize the importance of it and try to help our companies to the best of our abilities. This means adding our own communication resources to help our companies, spreading their messages through our own channels, building relations that can be of value for them, as well as helping them recruit the right talent when it comes to this area of expertise. Portfolio of companies provides stability but not every company in a portfolio becomes a success. Two disposals were made during the period. Both have been challenging growth journeys, to the extent that we had chosen a non-active role the last few years. The global collapse of the price of solar PV negatively affected the competitiveness of solar thermal. We have been selling our shares in Savo-Solar over a period of almost two years and have now sold the remaining few percentages. In One1, we sold all shares in one sale to the entrepreneurs in the company. The holding may still provide an additional income if the development of the company is positive but we will not value it in our balance sheet going forward. These exits do free up some additional cash, but it is nothing to write home about. It does however free up some energy when you decide that a company is no longer your concern, and in the case of Savo-Solar it should be mentioned that this marks the end to write-downs in the value of this holding that has been burdening our result every report. The journeys of these companies do not end here and we wish them all the success in the world going forward. We also thank them for the learnings and are using what we learned in other growth journeys. We now have 5442 shareholders, which is by far more than we have ever had. We value each and every one of you and are very happy to see that many of you are very engaged in what we do. I answer a lot of questions from you and we even get a lot of inspiration and new ideas from many of you. Thanks a lot, I can tell you that it is extremely motivating for all of us, so keep informed, keep the questions coming and engage with us on YouTube (where we run our own webshow ‘Cleantech and Coffee’, answering questions and bringing in partners and guests), Twitter, Instagram, Facebook, SoundCloud and anywhere else we are on the Internet! We will also be hosting an after work again soon with our companies present so keep an eye open also for that! Portfolio companies' performance during the review period and major events. The basis of Cleantech Invest's business operations are in the company's portfolio companies. The value of Cleantech Invest should reflect the value of the portfolio and it is through dividends but more often exits in these companies that the majority of income will be found. In the half-year review, and in the upcoming quarterly and annual reviews, Cleantech Invest will start commenting deeper on the development in core holdings. There will also be an attempt for each core holding to reflect on the current dynamics in the industry that this core holding is operating in. Core holdings of the portfolio are firms where the holding size and/or value contribution is significant enough to affect the value of the Cleantech Invest share. For listed firms, we report our effective ownership. Effective ownership means taking into account our full ownership and the indirect ownership through holding companies and/or via Clean Future Fund. For unlisted firms, we report effective ownership, fully diluted. Those holdings that are part of the venture and incubation portfolio will be commented upon only if significant development or larger funding rounds take place. The comments on either the core holdings or on the venture and incubation portfolio are not an exhaustive description of each of the associated company's situations or their risks. As a minority shareholder of its portfolio firms Cleantech Invest is not in a controlling position of its portfolio companies. 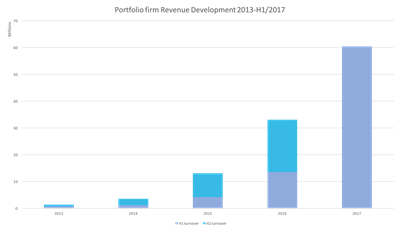 The portfolio firm achievement descriptions from each reporting period are written by the portfolio firm management and reported to Cleantech Invest management. After Enersize’s IPO, we rely on publicly available information on Enersize. Associated companies all share the common trait that they have a potential to create a significant positive environmental impact in the industry that they are disrupting. The combined revenue of the associated companies was 60 MEUR in H1/2017 (unaudited). The combined, unaudited, revenue of associated companies has grown by 343% when compared with H1/2016. All revenue figures are non-audited and are partly based to a significant decree on invoicing where the payment has not yet been received. Fashion is one of the most resource intensive industries in the world. Our current way of consuming fast fashion results in large amounts of energy and water consumption and heavy use of chemicals, not to mention the high social cost due to variating labour conditions in some producer markets. Despite a general trend towards sustainable consumption, fashion has gravitated towards faster sales cycles and the biggest brands are finding ways to sell clothing cheaper and cheaper. This culture of buy, wear once or twice, and throw away has a highly negative impact on the environment. By extending the life cycle of clothing through second hand trade, the manufacturing and associated environmental impacts are reduced significantly. Giving a second life to a piece of clothing is one less item produced. Currently, most second hand trade is through brick and mortar consignment stores. A smaller portion is through online market places such as eBay. These actors have, however, only scratched the surface in terms of the real potential for a secondary fashion market. Traditional consignment stores have a challenge of providing a large enough selection. Yes, you can find inexpensive quality items, but not necessary the ones you are looking for. Online marketplaces, on the other hand, have a good selection, but shipping expenses for delivery of a single item makes trade of less expensive items unviable. Furthermore, dealing peer-to-peer with other consumers exposes one to quality issues, uncertainty in timely delivery as well as fraud risk. Swap.com (Swap.com Services Oy) is an online consignment store that solves the challenges related to current second hand shops. Swap.com offers a selection of over 2 million unique items, all of which are quality inspected and delivered to your doorstep with a single delivery fee even when purchasing a large number of items. Swap.com takes care of professional photos, storage and delivery from its state of the art logistics center in Bolingbrook, Chicago. With the market's largest selection, it is possible to find the items one is looking for in the right size and colour, with a very large discount. In 2017, Swap.com has continued on its growth path and has been especially focusing on operational efficiency and actions increasing profitability. The company has also implemented a new brand strategy which is built on three cornerstones: discovery, thriftiness and reuse. Swap.com aims to be the category leader in online consignment, and estimates the market potential to be over $100 billion annually, in the US alone. Real Estate is the pre-eminent global asset class. The value of all global property, including commercial and residential property (and forestry and agricultural land) is estimated to be a whopping $217 trillion dollars. It is a well known fact that buildings consume a lot of the energy we use, as an example in 2016, about 40% of total US energy consumption was consumed by residential and commercial buildings. With new technological capabilities, we have begun to witness the next stage of the global real estate market. Dubbed the revolution of the ‘smart building’, the term implies an attributed ‘consciousness’ to something that we have previously only regarded as ‘property’. Between 2016 and 2021, the smart building market is expected to grow from $5.37 billion in 2016 to $24.73 billion, representing a compound annual growth rate of 34%. The Internet of Things (IoT) is the foundation of the smart building, and the number of measurement points in buildings are growing fast. Buildings are also becoming key players in the new energy system, as the foundation of virtual utilities, with assets that can be switched on and off turning buildings into generating entities as well. Expect to see an abundance of different building-user related services and evolving business models. For decades, buildings have gotten ‘smarter’ through the addition of clever features, such as remotely controlled heating units and other things. The outcome of these ad hoc technologies, or ‘point solutions’ has not been the rise of the truly ‘smart building’ but rather the creation of the ‘dumb building with smart features’, and there is a vast untapped potential in this sector. The Nuuka platform is hardware-independent, making it extremely flexible and future-proof. The Nuuka platform is also open, with anything and everything able to be connected to it. Nuuka analyzes and optimizes all data it collects in real time and converts it into useful information that when sent to the right user, at the right time, is making buildings smarter, more sustainable and more profitable. During first half of 2017, Nuuka signed new significant customer agreements with global leading firms both in the Nordics and beyond. The company started pilot projects in China and entered into a joint venture with a partner in California. Monthly recurring revenue based on order intake more than doubled and Nuuka is expecting this KPI to grow even further in H2/2017. Nuuka has recruited key talent in sales and marketing to its team in H1 and will be adding additional new key personnel in H2/2017. During second half of 2017 Nuuka will focus on adding new customers and further growing its business internationally while also delivering its first major projects in China and the US. Although renewables are quickly taking over the world’s energy production, it will take several decades to phase out the current fossil fuel energy infrastructure. For a fully renewable energy system, sufficient storage capacity also needs to be built to cope with the variable nature of renewables. As we are transitioning towards a zero emission world, natural gas is an important complementary energy source to renewables. There are two key reasons for this. First, the CO2 emissions of producing electricity with natural gas is appx half of that of coal. Second, gas turbines have flexible load following and have an increasing importance as back up power to wind and solar power. Furthermore, in the future gas turbines may also utilize hydrogen as the primary energy source, enabling hydrogen to be utilized as an energy storage. Natural gas turbines are commonly operated inefficiently resulting in unnecessary power losses. Appx. $7.5 billion is wasted every year solely because of air impurities in gas turbines. Due to air impurities, fouling of the compressor blades decreases efficiency, and fuel efficiency can deteriorate up to 5% and power output up to 10%, before periodical washing of the turbine. Eagle has developed and patented the world’s best performing air filtration solution for gas turbines, which significantly increases the efficiency of gas turbines. Eagle’s solution increases annual output up to 6% and improves overall fuel efficiency up to 3%. Utilizing the technology, the turbine needs to be washed only during annual maintenance, eliminating down time. Furthermore, the turbine life is extended. Eagle Filter’s product is the most advanced filtration technology on the market and is based on nano fibres, superior aerodynamics and a patented dual stage construction that enables effective pulse cleaning, durability and reliability. Eagle’s revenue H1 2017 has doubled from H1 2016. The company has customers in Asia, Africa, North and South Americas and Europe. The first years of operation at customer sites have yielded excellent results, with achieved annual savings of typically several million € per power plant. In H1 2017, after a rigorous and lengthy testing process, the company’s products received approval from Engie, the world’s largest gas turbine operator. Several projects around the world appointed by Engie are under evaluation and first projects have been delivered. Several other large utilities around the world have also tested Eagle Filter’s products and plan to roll out the technology to other sites. In China and South East Asia many projects are under negotiation with high savings potential. Strengthening operations in the USA will be in focal point for the near future. Industry 2.0 is the common term describing the increase in automation that can be seen across the manufacturing sector. Compressed air is a very common energy bearer in manufacturing plants across the globe and across industry verticals. Some 90% of all factories use it in some shape or form and it typically amounts to 10-35% of factory electricity cost. The Chinese manufacturing sector is the biggest in the world, approximately 10% of all energy use in China is used in compressed air systems. The focus on decreasing energy use in Chinese factories comes directly from the top. The new five-year plan sets forth plans to reduce energy intensity by 15 percent as well as ambitious targets for air quality progress (today, barely one-fifth of Chinese cities meet the air quality standards defined by the Chinese government). This is one of the reasons Enersize has focused on China, another is the fact that the carbon intensity in the energy mix, despite fast growth in solar power, is two times higher in China compared to EU, and almost ten times higher than in Sweden, making the positive environmental impact significantly higher on that market. The market for compressed air saving services tends to be local and tends to lack capability of achieving long term savings. Enersize analytics software manages the compressed air system and provides an attractive proposition that the market is responding favourably to: Improve the stability of your compressed air system, save energy costs with no upfront investment and show with proven numbers to officials how you are decreasing your energy use. Enersize software and savings are applicable across industries and customers are now representing industries such as glass, chemicals, cars, screens, and the cement industry. In June 2016, Enersize was listed on Nasdaq First North Stockholm, raising 28MSEK (before transaction costs) to the company in the process. The company signed 6 new customer contracts in a wide array of industries during the first half of 2017. The width of industry segments that Enersize targets can be seen in these contracts as they represent electronics, automotive, chemicals, building materials and pharmaceuticals. Three of the contracts where with recurring customers, which shows customers are satisfactied and that the strategy to grow with the customers is working. Enersize aims to reach several new customer contracts during 2017, and is well in line to achive it. The focus during summer has been to deliver and get the signed deliveries up and running. For full info on Enersize progress, please see Enersize 2017 H1 report that is available for download from Enersize homepage. Focus for Enersize is now on scaling up and recruiting high quality resources, both for Chinese operations and for software development in Lund, Sweden. Around 88 million tonnes of food is wasted annually in the EU, with associated costs estimated at 143 Billion Euros. Coupled with the fact that the respective activities to produce our food tends to come with a big burden to the environment (although very different depending on what and how it is produced and refined) this is a dramatic market failure. Digital food is a rapidly emerging global megatrend that has already created several multibillion dollar companies from startup’s. Most noticeable so far have been online delivery platforms such as Berlin-based Delivery Hero, recently stock-listed and valued at 4BNEUR+. The food marketplace has however seen fairly little in terms of cutting food waste using digitalization, which is where ResQ fits in, allowing you to find meals that otherwise would go to waste at heavily discounted prices, giving users a possibility to find good quality, inexpensive food and get to know new restaurants at the same time. In H1 2017 ResQ has seen solid growth, having approximately 10% month-on-month growth in its home market Finland. In Q2 the company was merged with German competitor MealSaver and is now well positioned for fast growth in Berlin and Düsseldorf during second half. Along with the merger, the company management was rearranged, with Oula Antere taking the CEO position. ResQ's product team pushed the platform forward, implementing a new world-class user interface, added new local payment methods, and made also the interface towards restaurants mobile. ResQ was chosen as one of the "10 hottest startups in Finland" by Talouselämä magazine, and received the Environmental Award from the city of Helsinki. Worldwide, the highest amount of water consumption is from industrial production. One of the main industrial sectors where Sofi Filtration concentrates is energy industry where large volumes of water are currently used. There is growing recognition that saving water saves energy, which saves money. Other water hungry industries with growing environmental awareness where Sofi Filtration focuses are mining and urban infrastructure projects. During the reporting period Sofi sold new installations to the energy industry and leased its solution to the infrastructure and mining sectors. With the current energy sector reference list of five delivered Sofi units for district heating applications and five units delivered for flue gas water treatment applications, the company now has the credibility to attract global players in the power generation industry. In the mining sector Sofi successfully concluded a pilot for a potentially 3MEUR project in the Nordics and a field trial in Louisiana, US. In addition, a funding round was carried out last spring where Cleantech Invest also participated. Going forward, Sofi is focusing on upscaling the sales in the power sector, as well as on large potential projects in metals & mining. The domestic and international response for Sofi technology has been positive last half year and it is becoming evident that Sofi’s self-cleaning, high-through-put filters can open up application areas for water recycling where there is no other solution available on the market today. The demand for decentralized renewable energy is growing for various reasons around the world, especially in developing countries. Shortages of available power is leading to unexpected utility power outages and power quality problems, which increases power costs and subsequently interest in using local energy resources and waste as feedstock for power generation. For the African market, energy demand is predicted to go up, driven by both population and economic growth. It is estimated that by 2050, Africa will be home to at least 2 billion people (a doubling of today’s population) with 40% living in rural areas. Currently, 600 million Africans (57% of the population) still have no access to electricity. Extrapolating current trends of energy access, in 2030 still 42% of the population, almost 700 million will not have access to power. At the same time, it is estimated that Africa's GDP will increase roughly three-fold by 2030 and seven-fold by 2050. To handle both the population growth and the economic growth, a much larger and better-performing energy sector, mainly driven by distributed energy solutions, is needed. Nocart’s main focus is on the African power market. During the reporting period, the major activity was to prepare everything for the PADIC Programme Shangombo Sugar Project in Zambia, where Nocart was awarded a 200MUSD project earlier this year to design, construct and install hybrid power plants to help drive sugar production. The shovel is in the ground for this project and the first deliveries to PADIC Shangombo project will take place during H2/2017. The firm is also working on to win a large-scale waste-to-energy project in Kenya and a hybrid project in Zambia. Aurelia’s order intake now stands at €2.4M with a sales pipeline of over €30M. Aurelia has 2 channel partners appointed with 6 others in negotiation. PlugSurfing grew its charging network from 33,907 charging points to 45,876 (35% increase). The company now provides EV charging access for car drivers in over 21 countries. Its userbase grew from 21517 users to 30893 (44%). Watty has sold out its first series of Watty boxes and signed over 15 large partners as ’Watty500’ partners. The partners are piloting the product in parallel with the development of proposals for a larger scale deployment. The company's revenue for the review period 1 January to 30 June 2017 was 18,000 EUR (1-6/2016: 38,000 EUR). Personnel costs during the review period 1 January to 30 June 2017 amounted to 208,000 (221,000) EUR. Other operating expenses in the review period 1 January to 30 June 2017 were a total of 296,000 (248,000) EUR. Higher costs are due to increased travel and office costs due to pop-office activity. Depreciation, amortization and write-downs of intangible and tangible assets in the review period 1 January to 30 June 2017 was a total of 89,000 (77,000) EUR. The company's operating loss was 617,000 (EUR 563,000) EUR. The increase in the operating loss was due to slightly smaller revenue and higher operational costs due to pop-up office activity. Financial income in the review period 1 January to 30 June 2017 was a total of 147,000 (24,000) EUR, financial expenses a total of 182,000 (EUR 190,000) EUR. The financial expenses were mostly due to Savo-Solar writedown. Cleantech Invest has now exited the Savo-solar ownership completely. Financial income was higher due to dividends from Nocart and interest income from associate company loans. The net loss of the review period 1 January to 30 June 2017 was 653,000 (729,000) EUR. The improved result is due to dividends from Nocart and interest income from associate company loans. The balance sheet total stood at 23,894,000 (7,425,000). The increase is due to a re-valuation amounting in total of 13,6 MEUR made to the value of Enersize, Sofi Filtration, Nocart and Nuuka Solutions shares in the end of 2016. The shareholders’ equity was 21,704,000 (7,348,000) EUR and the equity ratio was 90,8% (99%). Effective ownership takes into account both direct and indirect ownership in the portfolio firms. For listed firms, we report our effective ownership. For unlisted firms, we report effective ownership, fully diluted.Cleantech Invest has indirect ownership through the Clean Future Fund (CFF) and Cleantech Invest Swap SPV 1 AB, Cleantech Invest SPV 2, Cleantech Invest SPV3, Cleantech Invest SPV4 and Cleantech Invest SPV5, all of them Swedish holding companies founded by Cleantech Invest. Returns from portfolio company exits may in some cases differ from direct ownership percentages in portfolio firms, both in positive or negative direction. In certain instances, there are differences between ownership percentages and proportion of received exit proceeds due to different share classes and provisions in the shareholder agreement in a portfolio firm. Also, possible carried interest received by Cleantech Invest from CFF may increase the returns. Enersize Oyj: Enersize listed on the First North Stockholm in June 2017 and carried out a share issue of 2.9 MEUR in conjuction with the listing. Cleantech Invest ownership in Enersize was 37,7% after the share issue. Sofi Filtration Oy: Cleantech Invest participated in a funding round with other Sofi shareholders to enable expansion outside of Nordic markets. Cleantech Invest ownership in Sofi after the round was 24,7% (fully diluted, taking allocated management options into account). PlugSurfing GmBh: Cleantech Invest participated in a funding round with other PlugSurfing shareholders. Cleantech Invest ownership in Plugsurfing after the round was 3,0% (fully diluted, taking allocated management options into account). Eagle Filters Oy: Cleantech Invest executed a follow-on investment into portfolio company Eagle Filters. The ownership increased from 10 to 28%. In addition, Cleantech Invest has secured options to potentially increase its ownership to 40%. Alexander Lidgren acted as the Managing Director of the company during the review period. In addition to the Managing Director the company employed 4 persons, with Tarja Teppo, Lassi Noponen, and Timo Linnainmaa together forming the management of the company, with Joshua Burguete-Kirkman taking the role of Communications Director following a period consulting to Cleantech Invest. In the beginning of the review period the Board of Directors consisted of Lassi Noponen (Chairman), Peter Carlsson, Thomas Bengtsson, James Penney and Matti Vuoria. Gudrun Giddings joined the board at the AGM on the 21st of April 2017. General risks concerning the business environment of Cleantech Invest Plc are related to recent macroeconomic and capital market uncertainty. The associate companies of Cleantech Invest are start-up and growth companies, and there are remarkable risks involved both in their business operations and through investments in them. It is uncertain that Cleantech Invest is able to sell its holdings in associate companies in a profitable way or that the sale is possible in a planned schedule in line with the company’s strategy. Due to the nature of Cleantech Invest’s business environment, success in collecting finance for the associate companies’ operations is of utmost importance. There are no major changes in the risks and uncertainties since the date of Stockholm listing prospectus. However, the financial position of Cleantech Invest has improved based on the directed share issue that took place early 2017. The outlook for certain associate companies has brightened when they have succeeded in gathering financing and acquiring new customers, thereby sharing the revenue risk. On the other hand some of the associate companies have not reached their targets as to financing, operations and customers and it should be noted that several rely on successful funding rounds within the next six months to achieve their growth potential. The obvious time to partially exit one or several of our more successful growth companies is getting close. We see very strong growth journeys ahead for even the highest performers but we will aim to do partial exist in one or more companies largely to show our current and future shareholders the strong return on investments we are currently able to achieve. Two and a half year ago we embarked on a strategic plan to become the leading European cleantech accelerator. We wanted to make 2-3 listings and 1-3 exits and we also had an internal goal of market value which we have not communicated to the stock market (I can give away that we are not there yet but not too far from it if things go as we plan). At the end of this year, we will launch a new strategic plan that sets forth our trajectory, focus and goals for the coming three years. It will be ambitious, bold and out of the box so do not miss it. The growing global market for clean technologies where many of our companies have demonstrated competitiveness, certainly provides the basis for strong continued growth into forseeable future. The Annual General Meeting (AGM) of Cleantech Invest was held on the 21st of April 2017 in Helsinki. The AGM resolved that six members be elected to the Board of Directors and re-elected the current members of the Board of Directors Mr. Lassi Noponen, Mr. Thomas Bengtsson Mr. Matti Vuoria, Mr. James Penney and Mr. Peter Carlsson as members of Board of Directors and elected Ms. Gudrun Giddings as a new member to the Board of Directors. The AGM authorized the Board of Directors to decide on the issuance of class A shares in total amount to a maximum of 5,000,000 shares. This authorization canceled the previous dated 9 March 2016 on the issuance of shares. In addition, the AGM authorized the Board of Directors to decide, in one or more transactions, on the issuance of options. The number of new class A shares that can be subscribed to based on these options may in total amount to a maximum of 1,200,000 shares and may be issued to the key personnel, including members of the Board of Directors of the company, and to cooperation partners and advisors of the company as part of the company's incentive scheme. The AGM also authorized the Board of Directors to decide on acquisition of maximum of 1,145,000 company's own class A shares. At the beginning of the financial period the company had a total of 21,950,990 shares, divided into 4,569,031 Series K shares and 17,381,959 Series A shares. Class A shares have one vote at shareholders’ meetings and class K shares each have 20 votes at shareholders’ meetings. Cleantech Invest board members and management team owned on June 30th 2017 in total 3,344,072 K-class shares, 941,203 A-class shares, options that give a right to subscribe 1,854,028 K-class shares and options that give a right to subscribe 870,000 A-class shares taking into account all stock and options that the persons own directly and indirectly through companies controlled or influenced by them or through their family members. The shares represent approximately 18,7% per cent of the company's total issued and outstanding shares registered on the 30.06.2017 in the trade register and 62,4% percent of the voting rights of the shares. Cleantech Invest had 5442 registered shareholders according to the shares register on June 30th 2017. Euroclear Finland had 3291 shareholders and Euroclear Sweden 2151 shareholders. On 3rdof February, in a directed share issue, 933,000 new A-class shares were subscribed at the subscription price of EUR 2,74 per share, which equaled to the volume weighted average price of Cleantech Invest Plc’s class-A share on First North Finland during the time period between 23 January 2017 and 1 February 2017 and a discount of 10%. The Offer Shares represented approximately 4,1% of the outstanding shares in the Company after the Offering. Accordingly, at the end of the reporting period the company had a total of 22,883,990 shares, divided into 4,569,031 Series K shares and 18,314,959 Series A shares. At the end of the review period Cleantech Invest A-series share was listed both in First North Helsinki and Stockholm. Cleantech Invest’s market value at the end of the review period was 52,197,633 EUR. When non-listed K-shares are taken into account and the A-share price in Helsinki First North Exchange at the end of the review period is used, the market value at the end of the period was 65,219,372 EUR. The closing price in First North Helsinki on June 30th 2017 was 2,85€ per share. During the review period the highest price in FN Helsinki was 3,71€, the lowest 1,61 €, and the average 2,84 € per share. The Series A share has a liquidity provision agreement with Pareto Securities that fulfills the NASDAQ OMX Stockholm Oy Liquidity Providing (LP) requirements. Cleantech Invest Series A share trading First North Helsinki is not covered by the liquidity provision agreement. In August 2017 Cleantech Invest participated in an underwriting consortium to back Swap.com’s upcoming investment round, with a 1.5M€ underwriting commitment. Swap.com is working with Carnegie Investment Bank to execute a private placement. Also in August Cleantech Invest participated in an internal financing round in its portfolio company ResQ Club increasing ownership further to 14.7% after the investment. Several other current owners also participated in the financing round. Cleantech Invest Oyj Q3/2017 quarterly summary, which is not a financial performance report or a fully comprehensive report of all events, will be published 31.10.2017. The 2017 financial statement will be published on 30.3.2018. In other respects, the 2018 financial information release schedule will be published by the end of 2017.